This was a difficult decision for me. For the first time in years I opted not to attend the Ohio state championships. Though the games were moved from Stark County to Columbus, it’s obvious that the travel wasn’t an issue for me. And neither was the cost. However, I wasn’t expecting the games to be worth the time and effort. The bigger decision was whether I was going to see more games in Columbus or elsewhere for the weekend. Maryland hosted single title games on Thursday and Friday nights, and a doubleheader on Saturday. New Jersey, with their 24 title games, hosts them at four sites: MetLife Stadium in East Rutherford, NJ; Highpoint Stadium at Rutgers in Piscataway, NJ; Kean University in Union, NJ; and Rowan University in Glassboro, NJ. First, we’ll start with Maryland. As you may or may not know, Maryland’s association is only for public schools. Private schools will compete in one of two private organizations: the WCAC for the Washington area and the MIAA for the Baltimore area. Now, a question that’s brought up in Ohio is that this type of split would lessen interest in the public-only games. Honestly, it doesn’t. The fans that were there cared just the same as any other state championship game I’ve attended. The crowd was vocal, and a lot bigger than I was expecting. Given that Maryland isn’t the bastion of high school football. First, the setup. Maryland has four classifications and the 3A and 4A get the primetime games on Thursday and Friday, respectively. 1A and 2A get a doubleheader on Saturday afternoon. All four games are played at M&T Bank Stadium in Baltimore. Tickets were $10 each and parking was $7. The problem is, the stadium is an absolute pain to get to. Whoever designed the ingress and egress for this stadium failed horribly. However, after the drive down, I still arrived shortly before kickoff. M&T Bank Stadium doesn’t handle high school football well. First, they do not have their lightboards or videoboards on during the game. Nor do they keep all the lights on. This gives the field a dim, gloomy appearance. Only one small board is left up for the down and distance, score, and time. The stadium is a rather nondescript cookie-cutter. All sides are mirrors of the other. Overuse of endzone seats, and the video boards, if they were working, are placed in front of the upper endzone seats. Which forces those seats further out. Also, apparently due to the upcoming Army-Navy game, all the logos and emblems were pressure-washed off the field. Which also gave you large, very bright green, spots where the logos used to be on the field turf. There was no programs for the games. However, free roster sheets were handed out which were much nicer than you’d ever find elsewhere. THese were on heavy cardstock front and bank for the teams that day. The game itself was a matchup between Damascus and Franklin. Originally, this was projected to be a close game for Damascus, and it started out that way. The first half was entirely one sided as Damascus jumped out to a 21-0 lead late in the second quarter. With 30 seconds left, Franklin scored on a 30-yard touchdown pass and were set to get the ball to start the second half. Less than two minutes in, the lead was down to 7. On the next play after a recovered fumble, Franklin connected on a 47-yard TD pass to tie it going into the fourth quarter. With three minutes to go scored to go up 28-21. Damascus attempted some foolery, but a misplayed lateral turned into a fumble and recovered by Franklin who ran it back into the endzone for the touchdown with 4 seconds left. A 21-0 deficit turned into a 35-21 victory in the final 24:30 of the game. After the game, it was a drive east through Delaware into Southern New Jersey. A very nice hotel in the small town of Bridgeton was well worth the $44 or so on Priceline. The Star Liberty Inn Hotel is an old hotel that’s been well updated and amazingly priced for the quality. It’s a nice town, too. In the morning, it was some driving around. First up was entering Cape May County to clinch the last county in the state. We drove into the twon of Cape May before turning north and traveling a good portion of the Garden State Parkway north to route 3 to head to the Meadowlands Sports Complex. As mentioned, New Jersey has 24 state championships. This is due to the NJSIAA’s constitution dictating that there may not be any state-wide championships. So, they’re split by section. There’s five sections total. Four by geographic boundary and one Non-Public section. The four geographic sections are North 1, North 2, Central, and South. Each geographic section has five classifications which account for 20 of the 24 championships. The Non-Public section has four Groups. The higher the number, the larger the schools. The South Groups play their five championships at Rowan University in Glassboro. The other five sections play their championships at either of the three northern sites: MetLife Stadium, Rutgers University, or Kean University. In previous years, some games were played at the College of New Jersey in Trenton. However, MetLife Stadium was hosting 10 of the 19 non-South groups. The general schedule is usually each venue hosts a Friday night game and a quadruple header on Saturday. One of the smaller venues would then only have three games instead of four to equal the 24. MetLife was hosting two titles on Friday, four on Saturday, and four on Sunday. Kean hosted one game on Friday and four on Saturday. While Rutgers was hosting just four games on Saturday. Rowan, in a change, was hosting three games on Saturday and two games on Sunday. Now, there’s a protocol for playing games at various venues. First, is the MetLife rule. The average distance to MetLife Stadium for each matchup determines who gets to play here. Also, the largest Non-Public group (Group 4) plays on Friday night at MetLife as they’re almost assuredly local (this year was Paramus Catholic v. St. Peter’s Prep of Jersey City). Once all the slots are taken for MetLife Stadium, the remaining games are determined for Rutgers and Kean. Kean is, by far, the least intriguing northern location for games. This means that several Central groups can be playing at MetLife Stadium (the northern-most venue) if their teams happen to be really close and north. Such as Weequahic or Carteret the last time I was here. However, this year North 1 and North 2 had 8 of the 10 slots accounted for. Only the Non-Public Group 4 and Group 3 (Delbarton v. Red Bank Catholic) were the exceptions. New Jersey prices for tickets are regulated by the state. MetLife Stadium games are $9 per day, as well as Rutgers games. Rowan, Kean or elsewhere are cheaper. Though not sure of price. I believe $5. Parking is also set. It’s $12 at MetLife Stadium. The stadium complex for the meadowlands is quite extensive. Luckily, overnight our hotel was located just across the river in Secaucus the first night. First night was just under $90 at the Red Roof Inn. Neither game was particularly exciting. Paramus Catholic didn’t put up as much of a fight as I was expecting. Neither game stood out as a great game, but all four were close and competitive to the end. Pascack Valley-Paramus was a game that went down to the wire. It was a late score to give it the 16 point margin for Pascack Valley. Best nickname of the first two days was the Verona Hillbillies. Two issues with New Jersey. One was that they no longer printed and sold programs. The programs are available online for free now. Secondly, for the second time, there was rain. 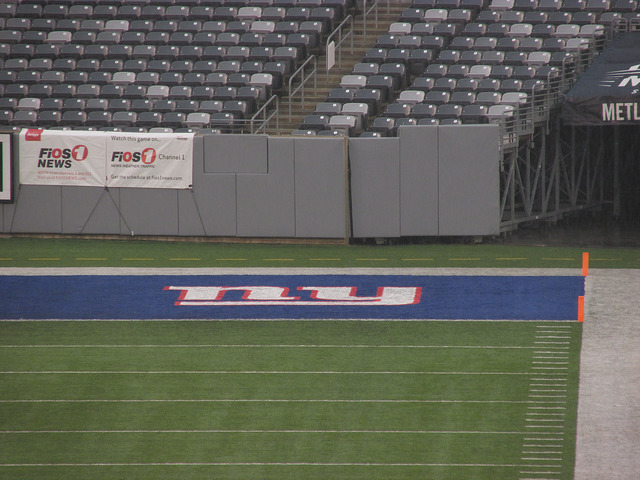 MetLife Stadium has two areas with overhangs, one in each endzone. Which is where a lot of fans congregated for both days. The sidelines, generally, are completely in the open. At first they didn’t want people in those seats, but the will of the people overruled that. Food at MetLife Stadium is about as expensive as other NFL venues. $9 for chicken tenders and fries, $11 for a cheesesteak, $5 for a muffin, $6 for 2 cookies, $5 for hot chocolate or gatorade. The $10 souvenir hot chocolate is the biggest scam. The concessionaires claim it’s larger than a regular but it’s really just the same size. You’re paying $5 more for the plastic mug. Which is funny that so many just leave the plastic mug behind. The stadium hosts both the Jets and Giants, and despite changing things over, they kept one endzone for the Jets and one endzone for the Giants. Which was a change from two years ago. This also spilled over to signage and colors in the stadium. Something that is generally turned over completely for games. Now, I had originally planned to see seven games this weekend. After the games on Saturday, was an overnight drive home followed by the Browns-Colts game on Sunday. This, however, became on issue. With the weather turning bad through Pennsylvania that evening and my girlfriend not wanting to make the trip we opted for two more nights in New Jersey. She stayed in the hotel to rest up and I went to the games on Sunday. The two middle games were really good. Cranford drove deep late in the game before running out of time. And Linden-Elizabeth was a big rivalry playing for a title, but Elizabeth just couldn’t get it done in the end. Luckily, for Sunday, the rain was gone though it was windy and quite cold. I ended up wasting the Browns tickets, but watched the game on my phone during the Parsippany Hills-Cranford game and the beginning of the Linden-Elizabeth game. In the end, probably happier not to have witnessed that game in person. Coming into this week, I had seen 99 games while my girlfriend had seen 90. The game in Baltimore was my 100th, with 10 more in New Jersey bringing my total to 110 on the season. My girlfriend saw the first 7 before opting out for Sunday not feeling the best. She’s now seen 97 games as of Week 15. After finishing work for the year, it’s the home stretch. Week 16 will be four games in Hershey, where I’m writing this from, and the Browns-Bengals game on Sunday. Once settling home Sunday night, it’s a quick turnaround to head out to Arlington, Texas for Week 17. Ten games at AT&T Stadium on Thursday, Friday, and Saturday. Then, it’s three days east to Fort Lauderdale to spend Christmas with my girlfriend’s family. In the meantime, we may see the Boca Raton Bowl on the 23rd and the Cavaliers-Heat game on Christmas Day in Miami. Then there’s the three Burger King State Champions Bowl Series back at Boca Raton’s FAU Stadium. After that, we’ll head back home.